EEEEEEEK, I am so excited to finally have my space back! 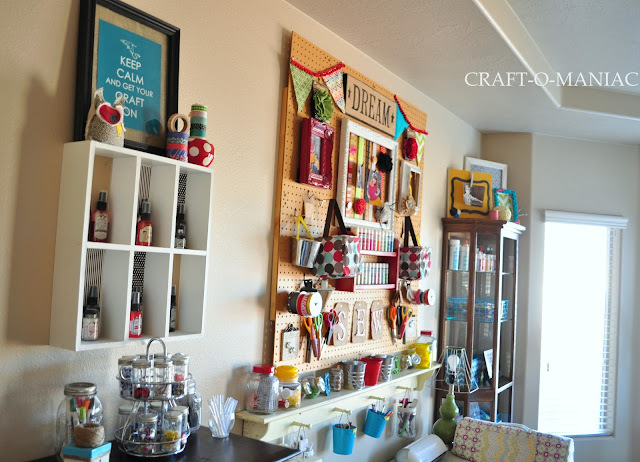 My colorful, happy, organized “Craft Space!” Today I am sharing my Craft Room Wall Reveal. 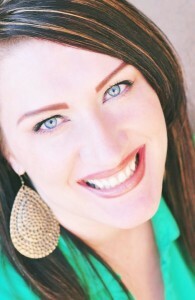 Today I am sharing “more then enough” HA! 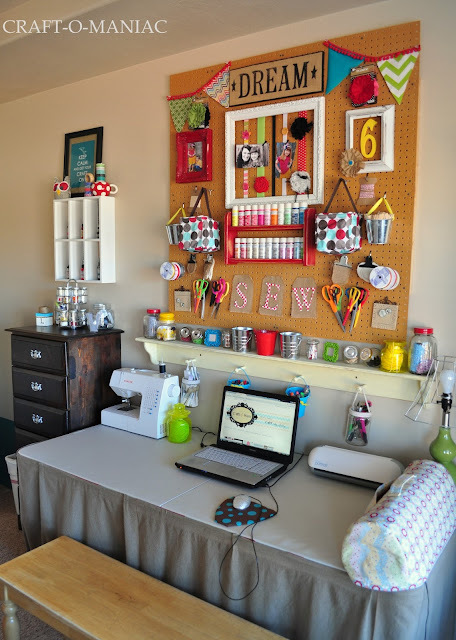 pictures of my “CrAfT Room Wall” I took up one wall in our MB to create my space. 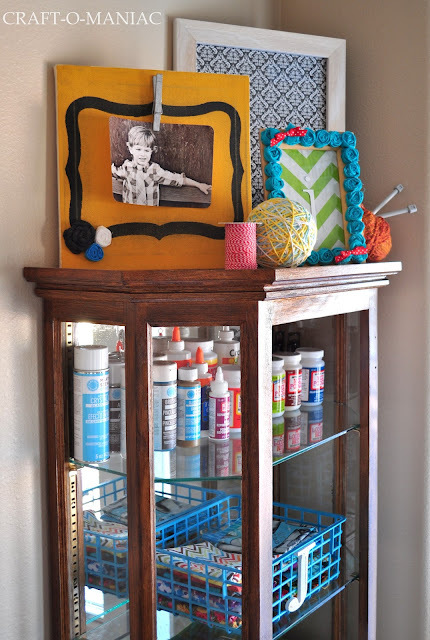 I used stuff I had, like the dresser, the curio cabinet, the long shelf with pegs, and the peg board found in the garage. I love COLOR, as you can see and all the color makes me happy. 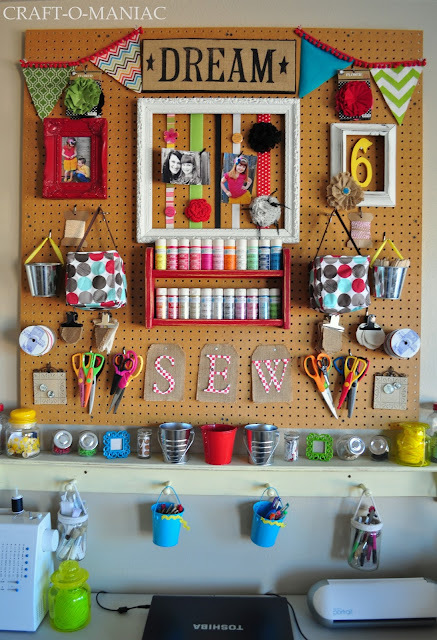 I loved using the peg board to create my space. 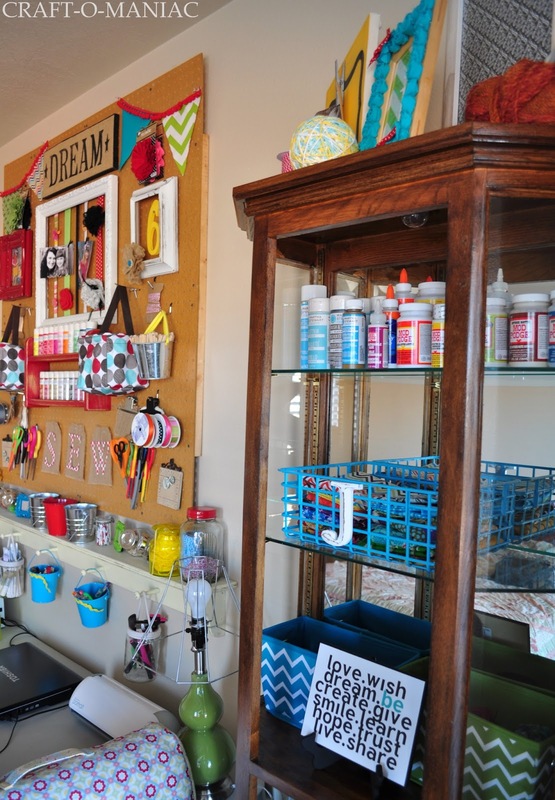 I hung buckets, clips, scissors, frames, canvas flowers, bakers twine, ribbons, and more. 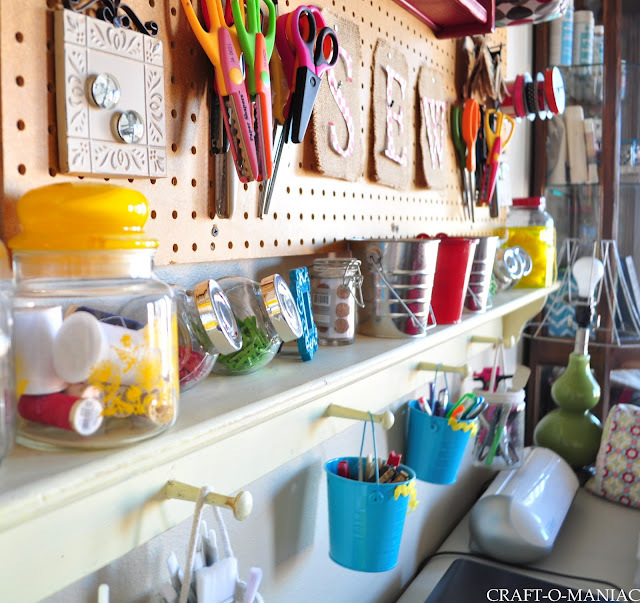 Everything hung from peg board hooks, it sure was fun playing with the peg board. I sure hope you enjoy this space as much as I do. That’s it, my favorite place to be creative. If you have any questions about anything at all, please email me or leave a question in the comments, and I will respond. Thanks a bunch for stopping by. and Creating with the Stars! Love this! 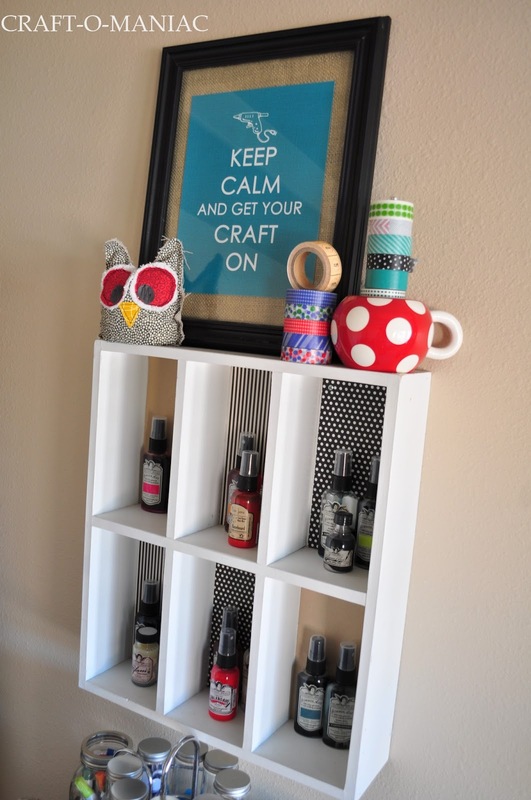 I have organizing all my craft supplies on my do now! 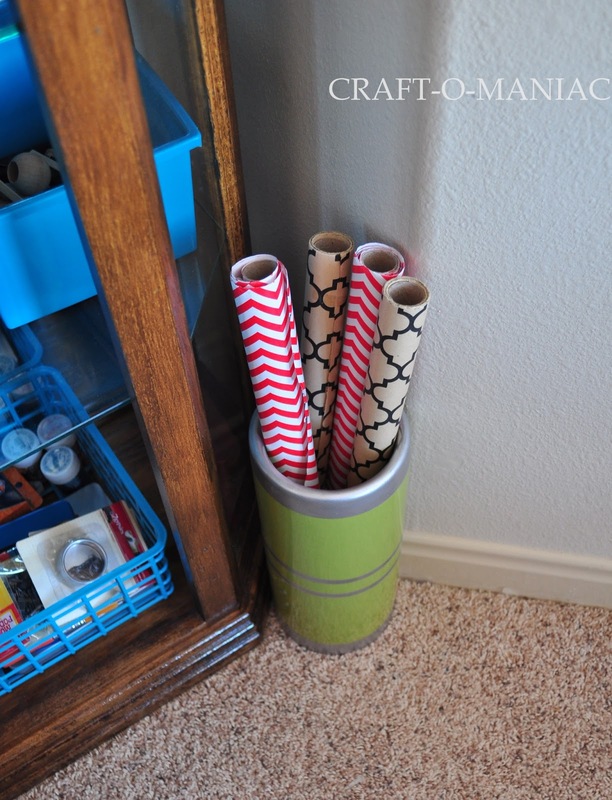 list…I’m going to use some of your storage ideas! omg! this just makes me weak in my knees…so pretty and organized…love love it!!! WOW, I’m really kapowed by your space, lucky you!!!! Really wonderful job with so nice Storage solutions! Thanks for sharing! I love it! Very pretty and I love how colorful it is. It just looks like a happy space. 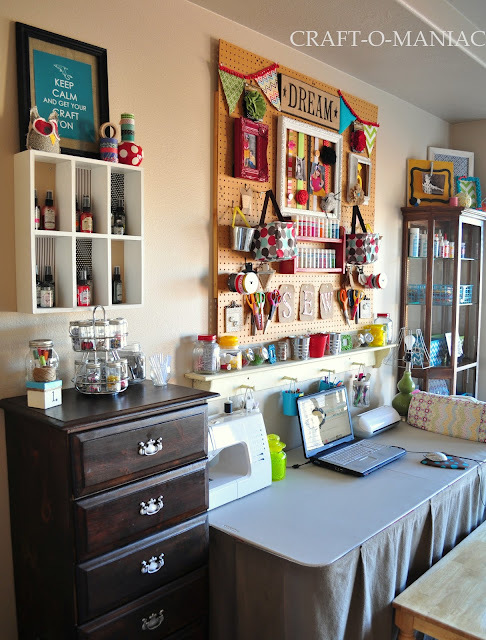 Awesome and straightforward crafting space! Love it! Wow, looks amazing. So fun and colorful. Great job!! holly color batman I LOVE LOVE LOVE it! Fabulous job!!!! Super cute. Great job Jen! Wow, looks great. I’m a little jealous. Wish I had a space like that. I need one of my kids to move out. lol. Only kidding. Thanks for sharing. This is my dream! 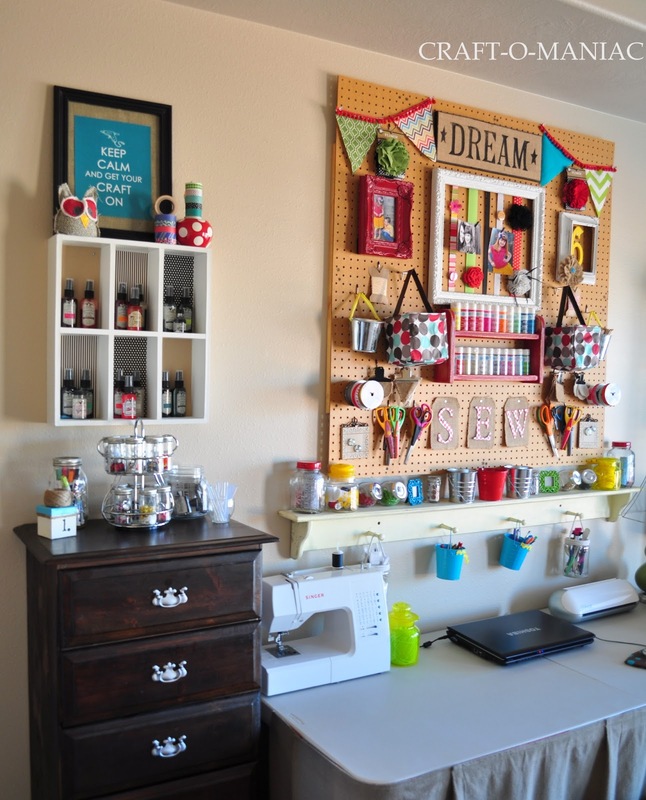 I LOVELOVELOVE how you’ve used the spice rack for embellishments, buttons, etc! So creative! And honestly- the glue sticks!!! I never know what to do with mine!!!! I love it! I LOVELOVELOVE!!!!! 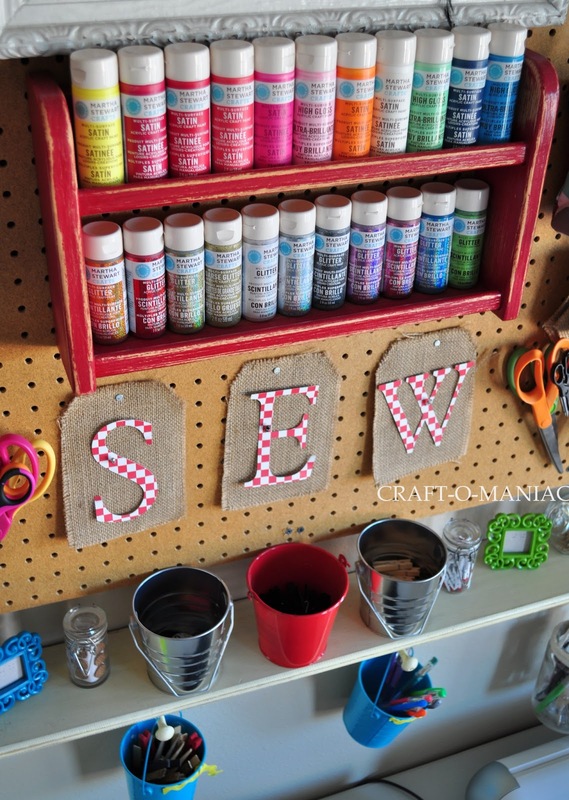 I adore how you’ve used the spice rack for embellishments and buttons, etc. and the glue sticks!!! I never know what to do with mine! Now- I have a TON of tulle and RIBBON… Any ideas on how to store that? I’m sure I could look up Pinterest but I’d get sidetracked and start another unfinished project and my husband would kill me. You’re so lucky to have a WHOLE WALL for your stuff!!!! (A gorgeous wall I might add) you’ve encouraged me to create wonderful things and I’m so excited to get started!!! Amazing job, jealous doesn’t even come close, that peg board is amazing. How did you attach the rack to it? I love your room. Gave me some amazing ideas for mine. I have an old curio cabinet like yours just gathering dust in my garage. Never thought of using it in my craft room. THANK YOU! So stinkin’ cute! I created my craft/office room last year! It is totally Lilly Pulitzer inspired!!! I adore my pink palace! Your space is tres perfection! You have got it together lady! LOVE this use of space! My favorite has got to be all the little bottles of paint lined up..so cute and so functional! Great job! 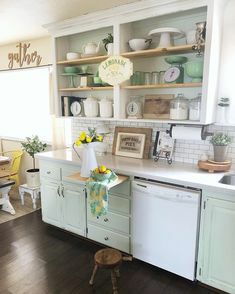 I L-♥-V-E this space! There is a lot going on, but it doesn’t look cluttered or messy at all. Very inspiring! 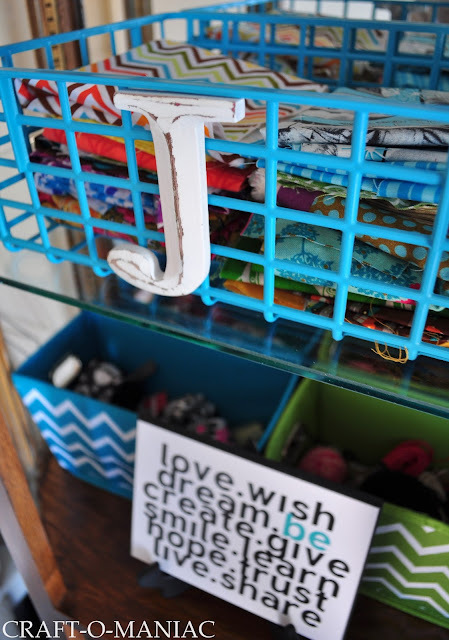 And, may I add, as a Thirty-One Consultant, I love seeing such a creative usage as your two Little Carry All Caddys hanging oh, so symmetrically from your pegboard and I think I even spy a Square Utility Tote over on the second shelf up from the bottom on your tall wooden shelf! I adore everything about this! 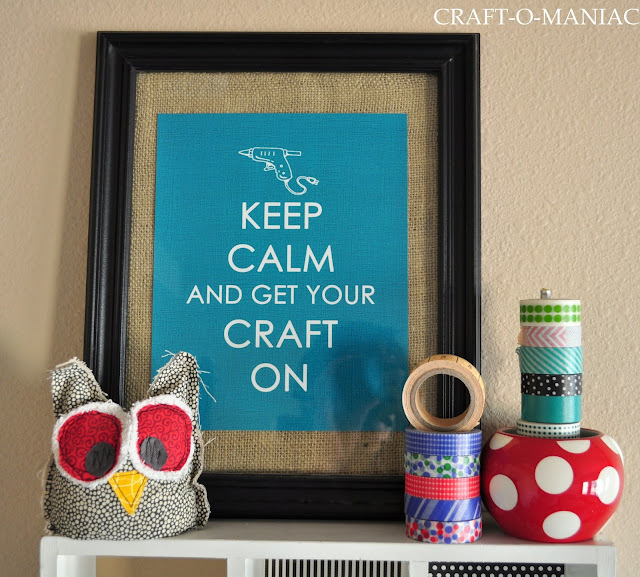 We are getting ready to finally do my craft room so I am looking for all sorts of inspiration. 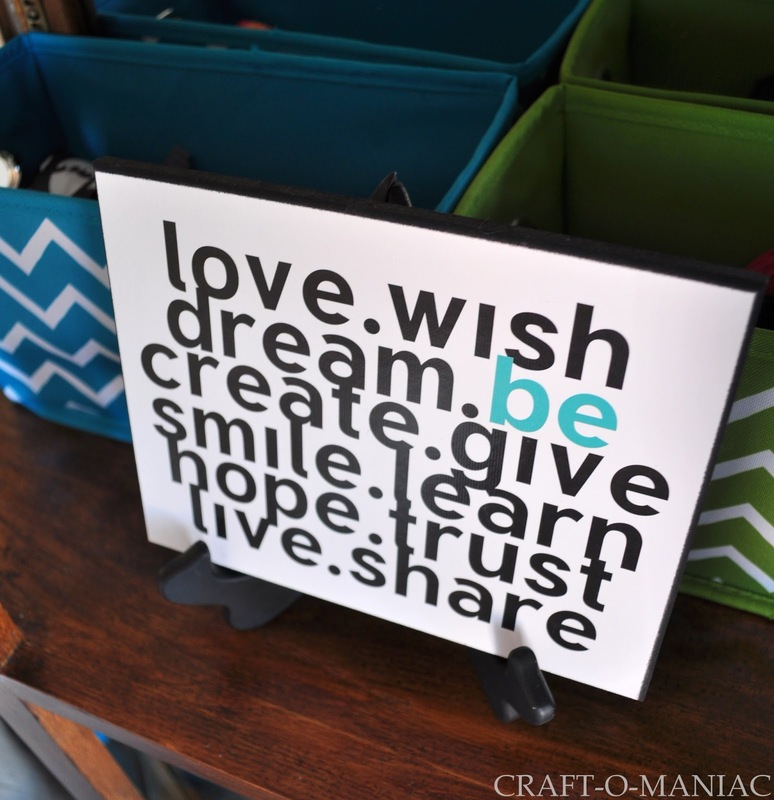 your peg board and shelf below is perfect and I am definitely going to need that printable ! Love it! I want a craft room!!! 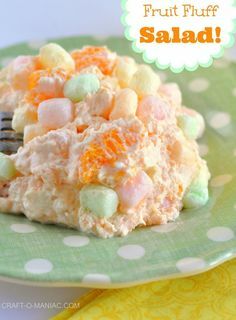 this truly looks full of joy! it’s super inspiring! Fantastic Job! 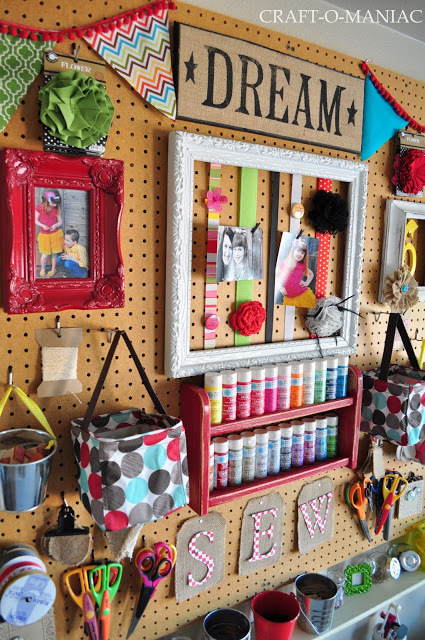 I love an organized craft space, I too recently make a Peg board painting that sits above my craft table, and absolutely love it! 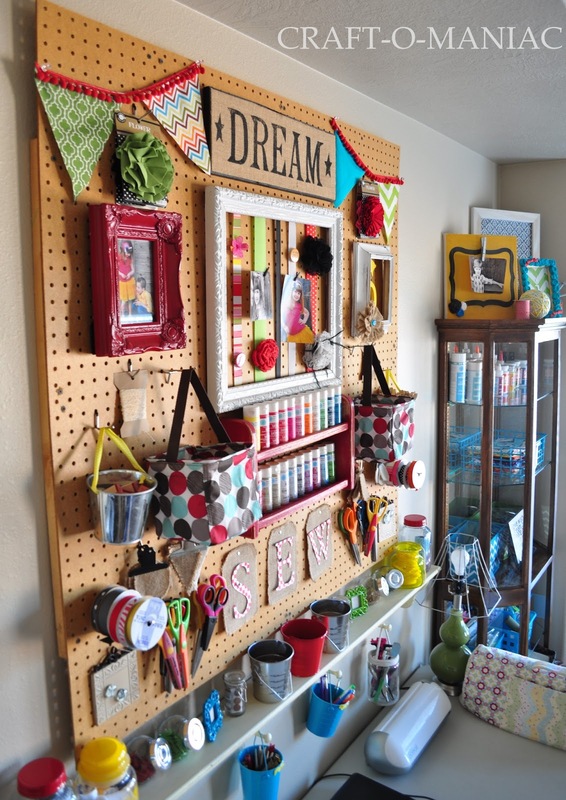 I love how you did your peg board, and it already looks awesome but it think it would be even more awesomer if you painted it that bright blue you have accenting all around your room… just a thought! 🙂 Have a great day! I love your craftroom. 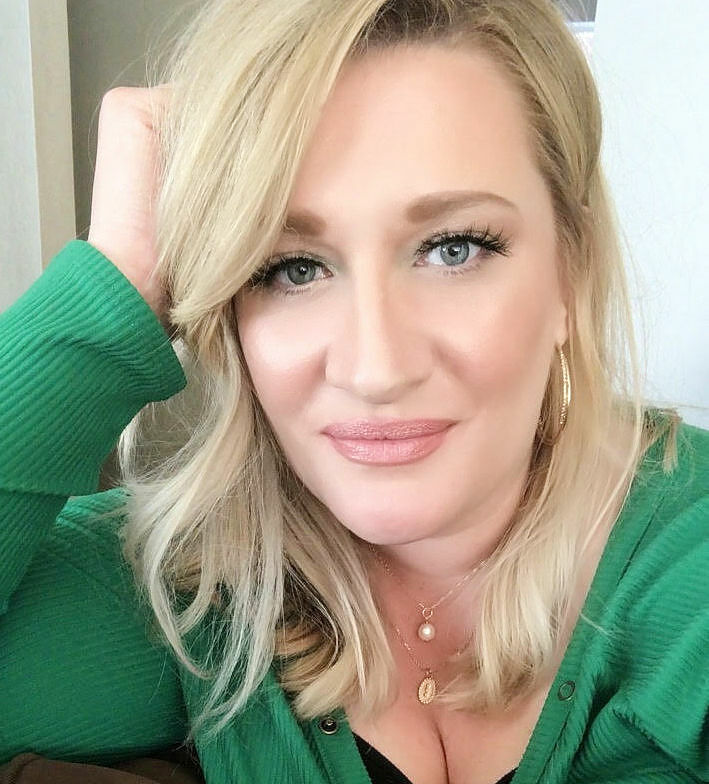 I am in the process of doing mine and I can just imagine what I am in for because I have to start right from the beginning by repairing a wall and painting the room. I really can’t wait until it is finished though. Sure puts my messy craft bin stuffed in a closet to shame! I love how bright and cheery it is ! Looks great, Jen! Had to pin it!! Beautiful!! absolutely love it and the colors are fabulous! Good for you!! Very nice. But if this is in your bedroom, how do you sleep? My brain would never shut off after seeing all those yummy supplies. I definitely would have to have a curtain or screen around it or I would never get to sleep! I would be up all night playing! I love it! I am so jealous. So pretty and colorful. Really great job! It looks like a fantastic place to create!!! Good luck with CWTS! 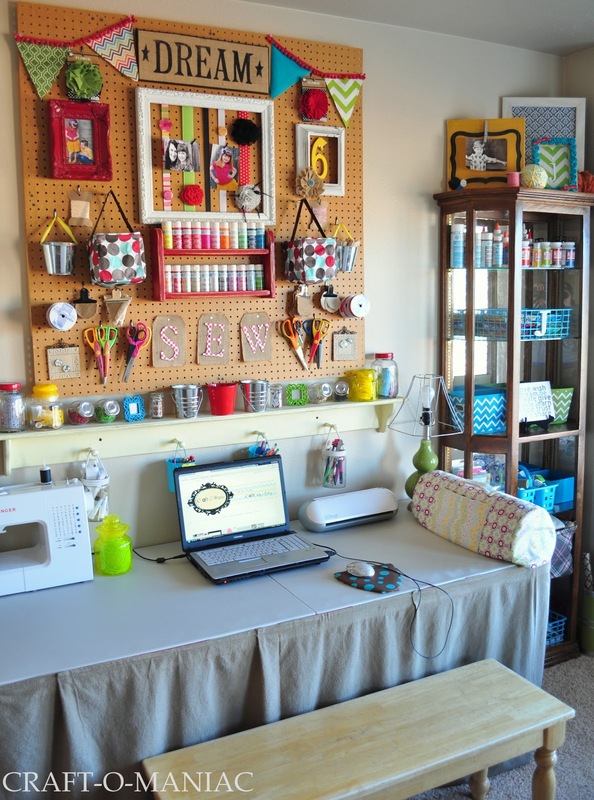 I love seeing how your craft space has evolved. I am working to redesign my own space, so this inspiration is great! Thanks for sharing! Andrea, at The Cottage Market Blog mentioned your wall. My husband created a craft corner for me in the garage. He painted the peg board and table white and make a little sign for me. I’ve been dragging my stuff out there and still have to sort and organize everything. I’m having fun while I’m doing it. Your room is gorgeous!! 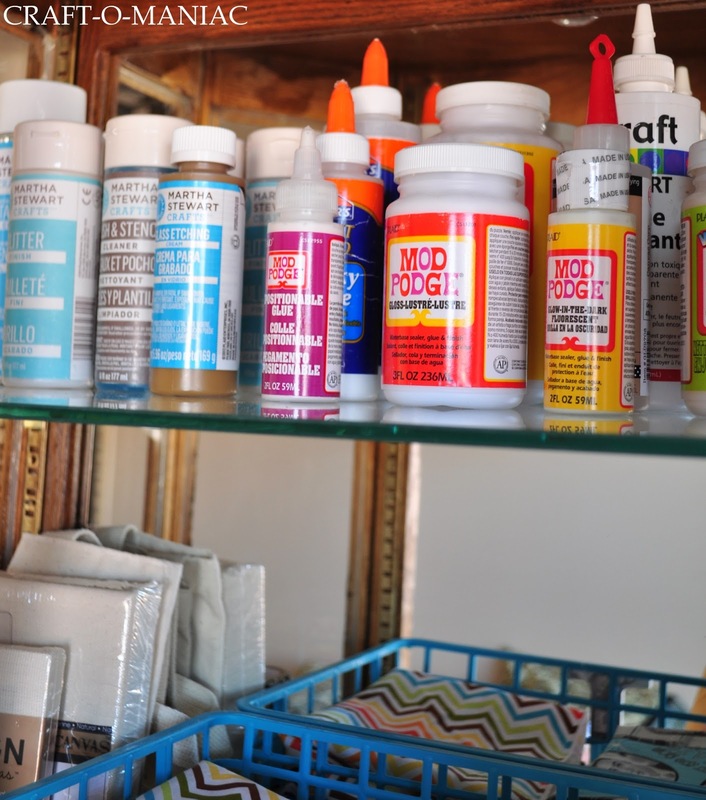 I hope you don’t mind if I borrow a few ideas to use in my craft room….which we’re renovating right now! I love all the ideas and it is very cute, but how does it work practically? 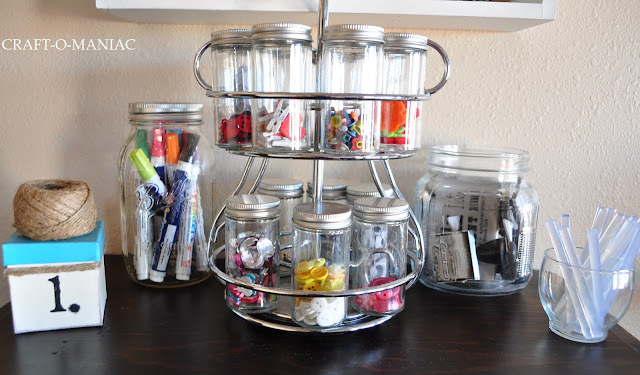 The real challenge is a space where lots of things are within arms reach AND it’s cute.